Bedroom 4 has a double bed and a single bed. Villa Ilia can sleep up to 9 people. Villa Ilia has a fantastic sun terrace with spacious swimming pool, over looking Rethymnon and the beautiful sea beyond. The villa also has a garden area with brick barbecue. You will enjoy amazing sunsets reflecting over the pool. Massage and other personal care services (such as manicure, pedicure etc), from certified professional.On request and at extra charge. Highly recommend this villa to anyone. 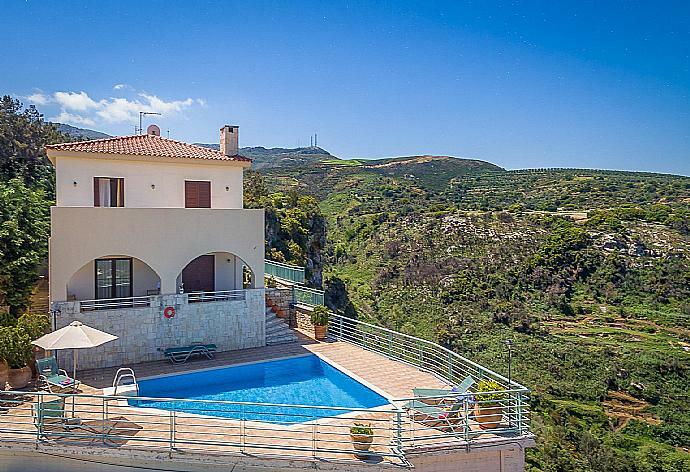 Great panoramic views, clean and well equipped. The outdoors had plenty of seating areas with views as well. Thank you Maria for keeping a clean Villa and showing all we needed to know about Rousospiti. Villa Ilia had definitely a five star feel. We enjoyed the beautiful sea views and spent most of our holiday outdoors on this beautiful property. Thank you Agni Travel and Staff again for your great recommendations. Apart from the above points, it is a lovely apartment with beautiful views over the sea with a cooling breeze due to it being 300 meters above the sea. The gardens around the house are also beautifully maintained and the BBQ area is very pleasant. 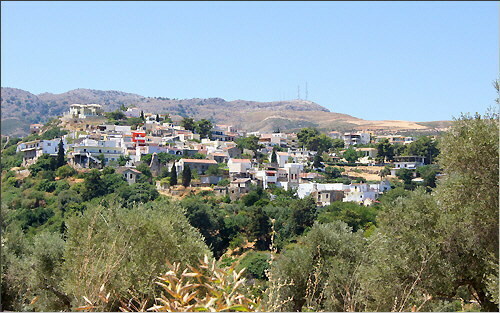 Roussospiti is also a very nice quiet village too with 2 excellent tavernas within walking distance, particularly Aloni CafÃ©-Restaurant..
We had a great holiday and we very appreciate the island and we found the people to be very kind. The villa is more beautiful in real than advertised on the website! After many weeks looking on the internet from villas I luckily came across Agni Travel. 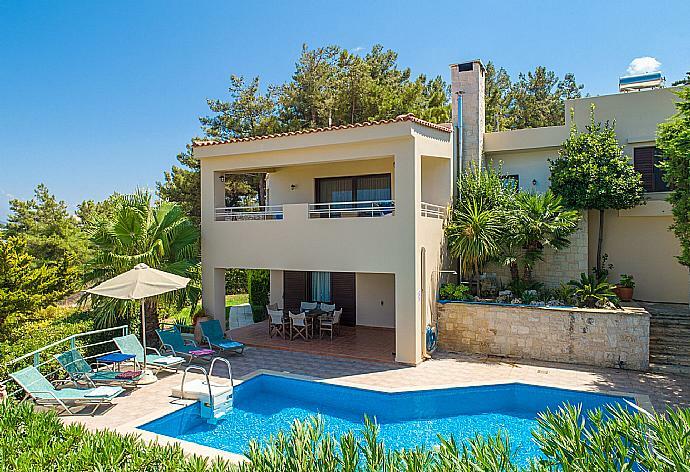 There were quite a few villas available for the dates we were looking for but we particularly wanted a large enough villa that had 4 bedrooms all with their own en-suites. We were lucky to find Villa Ilia. We arrived late on Saturday night and the villa looked great. We had a friendly visit from Maria the villa owner the next morning and she was very helpful and welcoming. We asked about the area and she was excellent at suggesting local restaurants and beaches.The villa is large and spacious the views were spectacular of the sea and the city of Rethymnon. After sunbathing by the pool during the day we would then move the BBQ dining area that evening to watch the sunset. Overall an excellent villa and we all thoroughly enjoyed our holiday. Wow!!! The views from the property are just amazing. Nothing better than to sit next to the pool and watch the day go by. The villa itself was clean and spacious and plenty big enough for eight. The BBQ was used almost every night even though it was only a quick walk to the taverna. The local supermarket proved very useful, especially for all the BBQ's!!! Rousospiti was built by the Venetians during the 12th century. Several of the original Venetian houses have been converted into tavernas and small village shops and you can still view plenty of remaining arches, gates and fountains from that period. Rousospiti is one of those timeless traditional villages, retaining a traditional Cretan feel, where visitors are welcomed. Villa Ilia was booked 2 days ago!